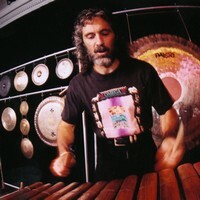 Tony Vacca is an American-born percussionist, composer, and educator who plays West African balafon, djembe, talking drum, an orchestra of gongs, drum set, and a one-of-a kind percussion unit. His music combines elements from a wide range of traditions. Tony has over thirty years performance experience as a percussionist/drummer, with sixteen plus study trips to West Africa, presenting programs ranging from educational concerts and workshop presentations in schools, to collaborative recordings, Jazz and World Music festivals, and special tours. Tony has recorded and performed with a wide range of musicians, including pop icon Sting, Senegalese Afro-pop superstar Baaba Maal, Jazz and World Music innovator Don Cherry, genre-defiant Yusef Lateef, Senegalese master drummer Massamba Diop, Gambian twentieth-century griot Foday Musa Suso, Abiodun Oyewole of The Last Poets, and Italian folk drummer Alessandra Belloni. Tony’s music reflects all of these influences and more. Tony founded World Rhythms in 1993, a production company that reflects the global nature of music featuring local, regional and internationally known performers. Together they form a consortium of musicians whose collective skills and insights create a wide range of programs from concert performances at Jazz and World Music festivals, to recordings, videos, and "hands-on" educational workshops, master classes, and concerts. In 1995 Tony created The Senegal-America Project, an exchange program bringing musicians from Dakar, Senegal together with the World Rhythms performers from America. These tours include concerts and workshops in elementary, middle and high schools, giving Senegalese and American students a chance to learn more about each others' worlds. PHILOSOPHY: Lyrics excerpt from “Culture Collision” by Tony Vacca, “The world is a big place and there’s room enough for everybody.” Music is the common language and link to communicating and getting along with everyone in the world. Music is a teaching tool that helps some students “see”, understand and learn in a new way.